Situated down the sought after end of Spencer Road and less than a three minute walk from the boat ramp, the FAMILY LAKE ESCAPE is the perfect place for your next family holiday. With 5 bedrooms, 2 bathrooms (one is en-suite) this Lockwood home can comfortably accommodate a 2 family or inter-generational holiday. It is warm in the winter and cool in the summer. It also gets a good deal of sun and there is heaps of space for parking cars and your boat off street, both of which are a bonus at Lake Tarawera. It has a Kent wood burner and the fire wood is provided, making it a nice and cosy place to stay in the winter. 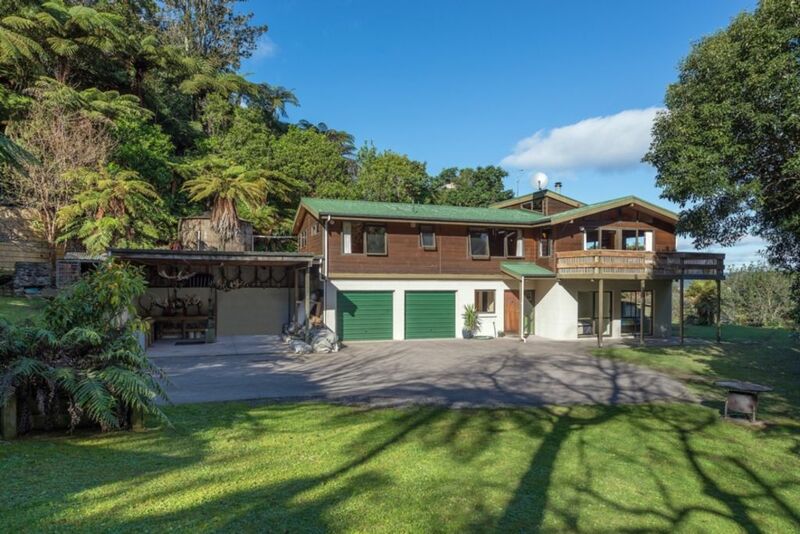 The home is nestled in the native bush with views over the Otumuto Lagoon and the Tarawera Plains, which makes for great evening BBQ’s on the deck serenaded by a multitude of native birds. The FAMILY LAKE ESCAPE is pet friendly and has a doggie door plus fully fenced (+- 90cm high) for your furry friends to run around in when you are out and about. House trained pets are also welcome to sleep inside but not in the bedrooms please. You will never run out of fun activities. If you are not fishing or water skiing on the lake, there is a single and a double kayak (and plenty of life jackets) to explore the Otumuto Lagoon. If that sounds like too much work, grab a drink and relax in the spa pool. There are also plenty of other options to keep both adults and children entertained. Upstairs has a 55 inch smart TV with Netflix and downstairs has an entertainment room with a 37 inch TV, Playstation 3 with a selection of games, Movies, a football table, dart board, table tennis table, board games, a croquet and cricket set for outside and the list goes on! The FAMILY LAKE ESCAPE is the epitome of a fun place for any family to enjoy and want to return too! Short walk to the boat launching ramp. Upstairs bathroom has a shower over bath, and a seperate toilet. The master bedroom has an ensuite shower and toilet. Covered with the linen package. 3 really good golf courses in Rotorua from about a 20 minute drive away. The house was spacious and suited the size of our group. Was abit disappointed with the downstairs condition. The bedrooms were not very clean didnt look like they had been vacuumed for a while. We had to vacuum before sleeping in them. You might want to look at the wiring for the spa. We were sitting in it on Sat night and the fuses tripped turning off the light and the Spa. Bit of a hazard. Otherwise we had a great weekend. It was so peaceful and an easy walk down to the reserve by the lake. The house was in a lovely quiet area, it had all the amenities for a long weekend stay. It suited our group very well and we would recommend the house and area to anyone wanting to enjoy a quiet location with lots of walking tracks available close by. we are 3 families who go to this area every year for a get together and some fun on the lake. with 6 adults and 6 kids we could all fit in here and have a great weekend. space for the kids downstairs was a bonus and very close to the water and boat ramp too. All are available in Rotorua, which is around a 10-15k or 20 minute drive away, and limited services only once out at the lake and the property.